I’m sure many readers here also follow Norman Lebrecht – if not, he offers on his daily news-digest a fascinating audio clip that should not get lost. It is Deryck Cooke explaining his completion of Mahler’s X symphony with Berthold Goldschmidt conducting excerpts as demonstration. My own experience with Berthold Goldschmidt and Mahler X is rather individual and full of unanswered questions. I deal to some extent with these puzzles in my previous article on Goldschmidt found elsewhere on this page. I knew him fairly well in the final years of his life and I recall asking his opinion on the composer Egon Wellesz. He had none. He seemed to indicate that he did not know him well and after I suggested that I had heard that Wellesz was rather ‘academic’, his only response was ‘perhaps’. Years later, while researching Egon Wellesz for an exhibition at Vienna’s Jewish Museum, I chanced upon a fascinating correspondence housed at Austria’s National Library. Egon Wellesz had been contacted by Berthold Goldschmidt to intervene on behalf of himself and Deryck Cooke with a recalcitrant Alma Malher-Werfel, who along with Erwin Ratz, head of the International Gustav Mahler Society in Vienna, was adamantly opposed to the work’s completion. The tone of the Goldschmidt/Wellesz correspondence, an exchange of perhaps half a dozen letters, is friendly but formal with Wellesz expressing initial scepticism which quickly turned to both enthusiasm and admiration. In almost all of the Wellesz side of the correspondence, one reads ‘as usual, meeting at your home in Belsize Park’, meaning the tiny flat Goldschmidt inhabited from 1935 until his death in 1996. Further correspondence from Wellesz to Alma confirms that he wrote about the Goldschmidt/Cooke completion with great conviction and stresses their sensitivity to every aspect of Mahler’s musical persona. Since the work’s established position within the canon, Goldschmidt has tended to be gently shunted to one side. Yet it’s worth remembering that if Cooke was the architect, Goldschmidt was both engineer and builder. He provided the orchestrations and the filling out of harmonies while developing thematic ideas as only a composer could. Without doubt, I’m sure he added far more (as is the wont of builders vis-à-vis architects) to the design than Cooke seems prepared to admit. Perhaps, he was generous to Goldschmidt and it was, as so often in the case of émigré musicians in Britain at the time, the British music establishment who heaped the glory on Cooke while cold-shouldering whatever contributions Goldschmidt may have made. The Goldschmidt I knew was too quiet and withdrawn to have made much of a fuss. He had lived a life that had consisted of a steady stream of injustices and disappointments. The British establishment was still wary of Germanic influences and hopelessly insecure about the very high standard of skills they brought. In fact, Goldschmidt’s intimate championing of Mahler in Britain had started far sooner. 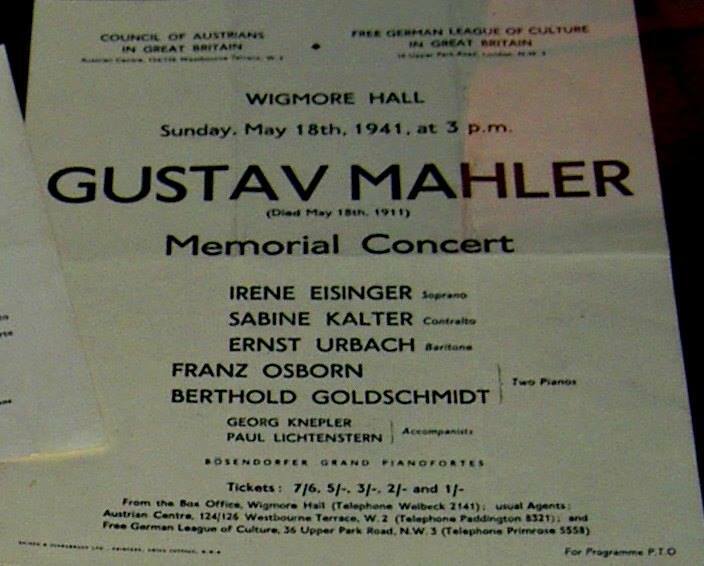 Peter Stadlen and Georg Knepler in quite separate interviews confirmed that British post-war enthusiasm for Mahler was down to performances by Berthold Goldschmidt and Franz Osborn of Hans Gál’s arrangements of Mahler symphonies for 2 pianos. These performances were initially kept within the confines of refugee organisations such as the Austrian Centre or the German Cultural Federation and not open to the general public until later in the war. Indeed, such events were often the only performances available beyond the mid-day National Gallery concerts organised by Myra Hess. Later, while searching through the archive of the International Gustav Mahler Society, I found a letter from Egon Wellesz to Erwin Ratz enthusiastically extolling a Goldschmidt performance of Mahler’s V. He wrote that ‘not since Mahler himself’ had he experienced such understanding and authority. Some time later, another letter to Ratz takes it all back and blasts Goldschmidt on every conceivable musical point. What happened? The answer has probably gone to the grave. Alma refused to allow the commercial release of Goldschmidt’s performance of Mahler X as she was hoping for someone more high-profile. She also later wrote to Cooke that it was her friend Harold Byrns (and not Egon Wellesz) who had convinced her of the validity of his completion. Harold Byrns, (born Hans Bernstein), according to Goldschmidt, was drunk when he conducted the premiere of his cello concerto and ruined any chance of the work’s possible success. Goldschmidt never forgave him and remembered how abused he felt while attending the rehearsals. I might have put this attitude down to sour-grapes had Byrns not also been the conductor of the premiere of Korngold’s Symphony in F-sharp, a performance that depressed Korngold so much, that he requested that the broadcast tapes taken by Austrian Radio be wiped. Korngold was convinced that neither conductor nor orchestra showed the slightest sign of good-faith. One starts to sense that post-war factions were developing and Goldschmidt was slowly being shut out of being allowed to make any contribution to British musical life. I haven’t listened to Cooke’s broadcast yet – I shall do so as soon as I have the 147 minutes to spare. I wouldn’t miss it for anything.